Sand. Sea. 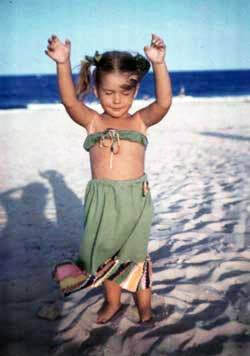 Sun began as a result of a lifelong love affair with the beach. I was fortunate to grow up on the Outer Banks of North Carolina, in the village of Cape Hatteras. My summers were spent pretending to be a dolphin or a mermaid and hunting the shoreline for treasures. ​As a little girl, I spent hours collecting driftwood, shells, sand and suntans ~ but the best discovery of all was always a genuine piece of seaglass. I still have a few of the pictures and mirrors I would decorate on rainy days, carefully placing each shell, each pebble, each piece of glass. The years passed as they always do, and while living on the island of St. Thomas I focused my creative side and began making jewelry. Through trial and error and genuine fascination, my jewelry career was born. I sold to my first galleries there, and then began attending retail and wholesale art shows along the East Coast. In 1995 I returned to Hatteras Island and concentrated on the development of my jewelry* lines and the business as a whole. All earrings have solid sterling silver earwires. CASCADE earrings: free flowing style created with recycled sea style pieces, glass tear drops and bright sterling silver fill chain. Caribbean blue and seafoam. Solid sterling silver earwires, 1.75”. DUO earrings: two pieces of matte finish glass in shades of pink and yellow. Beach glass style, hanging 1'' on solid sterling earwires. DUO earrings: two pieces of matte finish glass in shades of blue and seafoam. Beach glass style, hanging 1'' on solid sterling earwires. SUN GLASS earrings: sea style matte glass in organic irregular shapes. Sterling french style earwires, 1.5''. Pink. BIJOUX earrings: circles and spheres of matte glass beads. Seafoam with silvery heishe. Sterling silver earwires, 1''. BIJOUX earrings: circles and spheres of matte glass beads. Aqua and white with silvery heishe. Sterling silver earwires, 1''. DUO earrings: two pieces of matte finish glass in shades of pale green and seafoam. Beach glass style, hanging 1'' on solid sterling earwires. SUN GLASS earrings: sea style matte glass in organic irregular shapes. Sterling french style earwires, 1.5''. Ocean blue. ​Bracelets and necklaces coming soon!